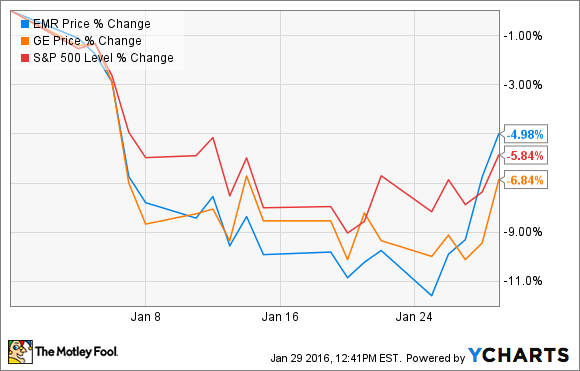 Will General Electric and Emerson Electric's 2016 Strategies Pay Off for Shareholders? GE and Emerson are pursuing eerily similar strategies for the coming year. Will they be able to pull off the same game plan? Is the future bright for these companies? Image source: GE. They're both big industrial conglomerates. They both begin with a seven-letter word, and end in "Electric." They both pay a nice dividend. But there are more similarities than these for General Electric (NYSE: GE) and Emerson Electric (NYSE: EMR). Their plans for 2016 are also surprisingly similar. It's unclear, though, whether those plans will pay off for shareholders. EMR Total Return Price data by YCharts. Both GE and Emerson are shedding parts of their companies. GE is selling its appliances unit to Chinese company Haier, and is divesting itself of many of its financial businesses. Emerson, meanwhile, has divested its commercial-storage business, and floated the idea of divesting more, as well as spinning off its underperforming Network Power unit into a stand-alone company. For GE, the strategy seems to be working, at least for now. Divesting most of its financial unit allows it to focus on its core industrial businesses, and is generating a lot of cash. GE plans to apply to the government for de-designation of GE Capital as a Systemically Important Financial Institution, which will allow it to return a lot of that cash to shareholders. And consumer appliances are a low-margin business that was sold at a premium price, so that's a net positive for the company, as well. For Emerson, the picture is mixed. It hasn't released many details about its proposed Network Power spinoff, so it's unclear how it will affect the company's bottom line. And even without the Commercial Storage business, underlying sales in its Commercial and Residential Solutions unit declined 2% last quarter. While Emerson's Network Power business has been slumping lately, it hasn't been doing as poorly as some of the other company's core businesses, particularly Industrial Automation, which saw sales decline 30% last quarter, compared to Network Power's 6% slide. It's tough to gain advantage by cutting dead wood when even your live wood is rotting. Oddly, the businesses that Emerson and GE aren't spinning off are their oil and gas businesses. These have been hit incredibly hard since fuel prices began dropping in 2014. Instead of selling or spinning off the oil and gas business, though, GE is reportedly looking to acquire more of the market by purchasing Halliburton's drilling business. Emerson, too, is hanging on. On a recent earnings call, Emerson CEO David Farr said: "Clearly, we have a challenging oil and gas and industrial marketplace right now but it's nothing new. We have been there before. We know what to do to deal with this issue." Whether staying the course is a smart move or not won't be clear anytime soon. It's possible that oil and gas prices will jump to a full recovery in 2016, reviving orders, and reversing the fortunes of GE and Emerson's oil and gas units. It's equally possible that prices will continue to languish or fall even further. Emerson's worse off than GE here, though, with a larger portion of its business coming from the oil and gas sector than General Electric. Both companies have identified "cutting costs" and "restructuring" as a way they intend to juice profits in the face of weak energy prices. Emerson's Farr said, "[The energy market is] why we started the aggressive restructuring last year.... [I]f the market continues to get challenging, we will continue to do additional restructuring." In a recent interview, GE's CFO Jeff Bornstein said nearly the exact same thing. He announced that GE was doubling its 2016 restructuring budget, to $3.4 billion, "with an emphasis on Oil and Gas." The company will also move its headquarters to Boston from Connecticut to avoid some state taxes, but the actual savings will likely be negligible given GE's massive size and global footprint. Cutting costs is generally an effective way to increase profitability. The only downside is that cutting costs too much can impede business growth. It's a fine line to walk, but the seasoned management teams at Emerson and GE have enough experience that they can hopefully find a happy medium. Emerson's Farr has been CEO since 2000, and GE's CEO Jeff Immelt has been CEO since 2001. Low oil and gas prices coupled with an uncertain economic outlook for 2016 have caused problems for both these companies, and their shareholders. However, while GE predicts modest growth, Emerson is predicting declines. Both companies are trying to execute the same three strategies to weather the storm, but it's not going to be easy. There's nothing either company can do about energy prices, so short of selling their oil and gas units altogether -- which would leave Emerson without much of a company! -- all they can do is cut what costs they can, and cross their fingers. Until oil and gas prices recover, though, neither company's stock is going to perform the way shareholders would like. 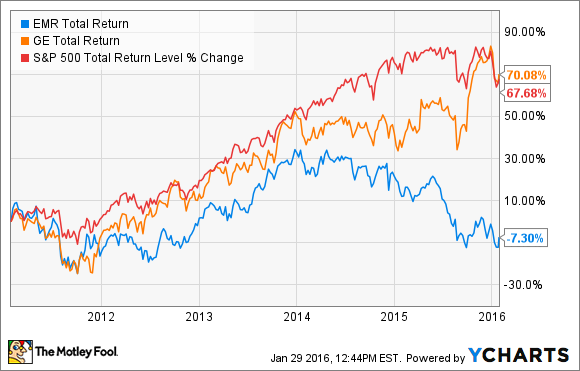 And even then, Emerson's track record of underperformance may continue. You may want to steer clear of these stocks until such a recovery begins.